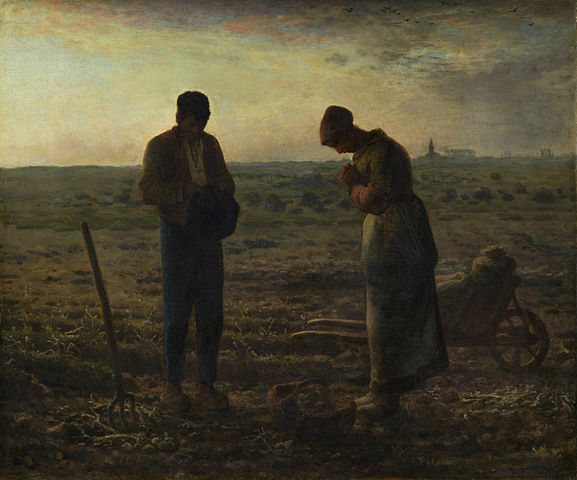 Jean-François Millet’s The Angelus portrays something that, for many people today, is a foreign experience. A pair of farmworkers, a man and a woman, set aside their work-tools and bend in prayer—she, with her hands clasped, and he, holding his hat. A basket of potatoes lies below and between them. The diffuse light, against which they are nearly shadows, suggests dusk. A steeple in the distance suggests the sound of bells. The novelty in question: Work actually comes to an end. Few of us have our grandmothers working with us in the fields. If we’re higher-wage, white-collar workers, our working hours are increasing more rapidly than any other group; we bring the office home with us and check email at all hours. If we’re lower-wage service workers or laborers, we work probably fewer hours than we need to earn a living, but we’re perpetually on call as scheduling software optimizes our working hours, inconsiderate of family or sleep. The steady boundary and communitarian regularity of the Angelus bell—traditionally rung daily at morning, noon, and night—challenge the “flexibility” now being demanded of us. The churches in my neighborhood don’t ring the Angelus bell anymore. (The closest thing is the muezzin’s call to prayer at a nearby mosque.) But I first encountered the Angelus, and the prayer that accompanies it, in college, where we read the words from laminated cards just before the weekday noon Mass. The angel of the Lord declared unto Mary, said the priest’s voice behind us, from the door of the chapel, to which we replied, And she conceived of the Holy Spirit. Then a Hail Mary, then more incarnational verses and Hail Marys, and a short concluding sentence wondrous in its grammatical complexity. In my work life now—a paragon of telecommuting flexibility from wherever and whenever—the Angelus has become a precious fixture. I mostly forget to say it, of course. But when I don’t, it bounds the beginning and end of the workday, sanctifying each, and abruptly, insistently interrupting in the middle, as if something other than the work before me matters. The story the Angelus tells is first of all one of willingness, of actively embracing a task at hand, just as Mary rose to her calling as Mother of God. She not only conceived but, as the prayer continues, exclaimed, Be it done unto me according to thy word. Second, the prayer is one of embodiment and immanence: And the Word became flesh / And dwelt among us. Here, even after interrupting work with a divine injunction, the prayer insists that the divine is also present in the people and things at hand, however fleshy and messy they appear. Upon returning to work, then, we take that incarnation with us. The painter Salvador Dalí had a particular attachment to Millet’s The Angelus, and he also had a premonition about it. He saw in the shape of its figures and the hue of its light a scene of mourning, not just work and prayer. This was not a widely accepted interpretation until, sure enough, the Louvre had the painting examined by x-ray, and the outline of a child's coffin could be seen under the basket of potatoes. The steeple in the distance, too, was a late addition. We don’t know why Millet replaced a burial with the Angelus; perhaps, simply, it would make the canvas more sellable to the pious. But Dalí’s insight, and the revelation that followed, implies a certain continuity between ordinary mortality and the prayer, which thwarts the work-day’s ruse to either mechanize or aggrandize us. It announces that the worker is still, and will insist on remaining, human.